This item is also available as a high def download via HDTRACKS. 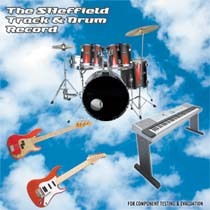 The four rock instrumentals on The Sheffield Drum and Track Record feature Robbie Buchanan and James Newton Howard, keyboards, Lennie Castro, percussion, Nathan East, bass, Mike Landau, guitar, and Carlos Vega, drums. These are followed by two famous drummers, individually, in free solo improvisations. They are Ron Tutt, most well known as Elvis Presley's drummer, and Jim Keltner, former member of Gary Lewis and the Playboys and musical collaborator with John Lennon, George Harrison, Ringo Starr, Bob Dylan and many others. The Absolute Sound said of the Track Record: "ABSOLUTELY THE BEST SOUNDING ROCK AND ROLL RECORD EVER MADE." And the International Audio Review praised the Drum Record: "The sonic fidelity of the Sheffield Drum record is enthralling, and its value for learning about your system makes it a must."